One of the largest hostage seizures ever ended with the death of 80 people, many of them foreign workers at Algeria’s natural gas complex at In-Ameras, located nearly 1000 miles from the capitol, Algiers, and less than 70 miles from the Libyan border deep in the Sahara. In the end it was both a human and political fiasco, the regional implications of which are still evolving. It was supposed to be an impressive show of force, `a message’ of how efficiently the Algerian government could deal with terrorism within its own borders. 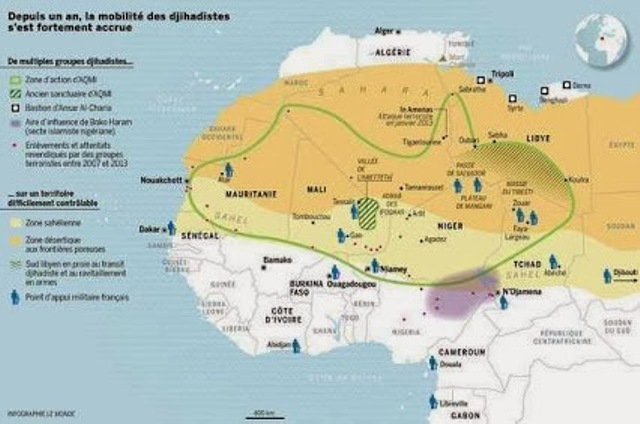 If Algeria was unwilling to engage militarily in Mali, Algiers would at least show how well it could manage terrorist threats within its boundaries, especially where it counts – its petro-chemical sector. The world’s oil and gas sector could rest easy. Algerian oil and gas is safe from terrorism. Had it worked out according to plan, Algerian special forces of its fourth military district that includes large slices of the Sahara, would have saved the day. The message to the world in general, but to the United States and France in particular, would have been, should have been: Algeria can handle domestic terrorism; there is no need for Algeria to get embroiled in Mali by sending troops that would be coordinating with the French and American militaries. But in ways to be discussed in later sections of the series, something went a-foul, the whole thing backfired terribly, and continues to.Keep in mind that although Algeria had a bloody civil war in the 1990s, called, appropriately enough `The Dirty War‘ by former Algerian security officer and author Habib Souaidia, never during that decade was an Algeria oil or natural gas facility ever attacked by guerrillas – a rather odd fact given the intensity of the warfare. It makes one wonder about the kind of radicals that would spare the petro-chemical sector from their attacks. The attack on In-Ameras, was thus, ` a first’, for Algeria at least, that must send chills down the spines of oil producers and consumers everywhere. To understand what was being played out in In Ameras, one has to dig deep, into Algerian history, the role of France, the emerging U.S. strategic-military role in Africa and first and foremost, the fate of the peoples of the region – Algerian Arab Moslems, Kabylie Berbers, Tuaregs of the Sahara, the people of Libya, Mali, Niger and Mauretania, among others. That is what I hope to do in this series of articles, the different threads of which will lead us to back to In-Amenas and the slaughter of innocents there. The series begins elsewhere in Algeria, in the north, outside of a town called Seddat, in May of 2006. Of the course of several articles the thread will lead us back to In-Amenas and the events of last week, but for now we’ll start the saga elsewhere. Let’s begin, not with the fiasco at the In-Amenas natural gas site on Algeria’s eastern border with Libya, deep in the Sahara Desert, but with a seemingly unrelated incident that took place seven years ago at a place called Seddat in the Kabylie region of Algeria east of the capitol Algiers. There, in May of 2006, with much fanfare, a major military operation was launched by the Algerian army to `neutralize’ (which translates in plain language as `wipe out’) a supposed Islamic terrorist cell holding out in a cave in the vicinity of Seddat. Despite the fact that the so-called war against Islamic terrorism had supposedly ended by 1998, the Algerian government had not been able to eliminate the last pockets of militant Islamic armed resistance. For nearly eight years Algiers had been repeatedly talking about “the last Islamic strongholds”. There was another problem which plagued the Algerian government, formally a parliamentary democracy, but informally and perhaps more accurately, a military dictatorship which had been run from the shadows since independence by a group of military officers, derisively referred to as the D.A.F. (which stands for Deserteurs de l’armee francaise, or deserters from the French Army. It refers to a group of Algerian officers in the French military during the Algerian War of Independence 1954-1962, who, six months before the end of the conflict, jumped ship from the French army and joined the Resistance and then quickly took power once independence came). By 2006 the ruling Algerian military junta could not simply brush off the repeated accusations that many of the militant Islamic groups that it claimed to be fighting in the 1990s were both infiltrated by and run by the country’s powerful intelligence service, the Departement de Renseignment et de la Securite otherwise known by its initials – the DRS – . It all cast a shadow over the bloodshed the 1990s and raised serious questions as to what the fighting was about in the first place. Something else had happened that plays into the plot as well. By 2006, a new security cooperation relationship was being forged between Washington and Algier especially in the aftermath of the September 11, 2001 attacks. Despite a certain distrust on both sides which continues until today even, over the five years since `9-11′ it had flowered into the beginnings of a political partnership. For different reasons, both the United States and Algeria were looking for new security partners. The United States needed a North African regional partner, a la the Shah of Iran, with a strong military to assist it in its growing “war on terrorism” in Africa. Then and now, it has been more about protecting U.S. strategic assets in oil, natural gas and strategic minerals than about fighting militant Muslims, a group of which there were precious few in North Africa at the time. At a time when the United States had already started to shift its security concerns to Asia to meet a growing economic and political challenge of China, finding `reliable’ security partners that could fill in the military vacuum had become essential. The United States hoped to partially extricate itself from Iraq and Afghanistan, at least `tone down’ those conflict and emerge from the quagmires it had created in the Middle East and Central Asia to focus on the Far East. Such a global strategy could not sustain a large scale U.S. military build up in Africa much beyond the present strength of AFRICOM. Finding others who might be willing to `partner’ with Washington, be it through NATO or other arrangements became more pressing. Two countries, both unlikely in some ways, to step up to the plate, did exactly that – France and Algeria. The series will deal with France’s role in Africa, past and present in the next part of this series and leave it aside for now. As for Algeria, while it is looking for U.S. military technology, communication systems, etc. the main `asset’ it hoped to gain from improved relations with Washington was political legitimacy, much of which had been lost during the country’s civil war of the 1990s and without which, its ruling strata could not stay in power for long and its economic prospects (selling oil and natural gas to the world) would be hindered. It was an unlikely ally in some ways. For half a century the U.S. media had dubbed it `the Cuba of the Mediterranean’, supporting, at least verbally, national liberation struggles, criticizing U.S. imperialism, allied with the Palestine Liberation Organization, a strong opponent of Israel and finding itself taking positions opposed to Washington’s on most issues at the United Nations. Diplomatic ties had even been severed for six years in the aftermath of the 1967 Middle East War. Here again, things were not always what they seemed. Much of the so-called antagonism was little more than posturing on both sides. For example, even during the period when U.S. – Algerian official diplomacy was frozen, Algerian-U.S. economic relations actually flourished, especially where they concerned Algerian natural gas and oil production. The United States was anxious to break into the Algerian energy sector and did so early on with companies like Halliburton (and others). For its part, Algeria had no qualms about allying itself in business with the most conservative, if not reactionary elements of the American political spectrum, and did so enthusiastically. 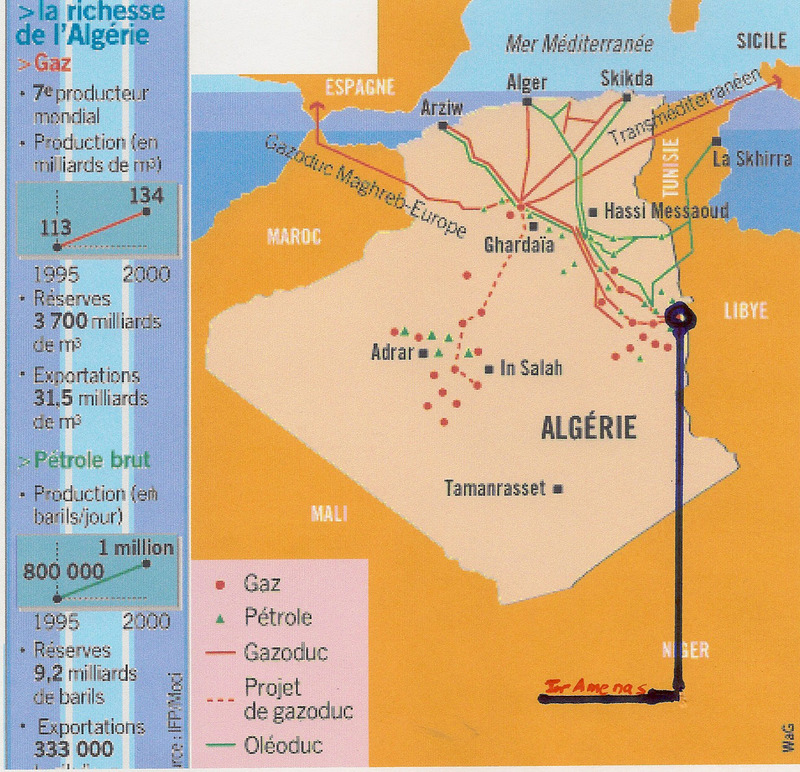 The United States helped Algeria break the French stranglehold on Algerian energy when, in the early 1970s, El Paso Natural Gas of Texas engaged the Algerian government in a deal to buy its natural gas. It started a flood of contracts with other countries willing to sign agreements with Algiers; if Washington would, why not other countries? While the Algerian – U.S. energy relations went through ups and downs, they became once again quite intense after the collapse of the Soviet Union when Algeria began to privatize big chunks of its petro-chemical industries. On the security front, Algeria was anxious to prove – and the United States was anxious to believe – it could be a `reliable ally’ in the war on terrorism, that it could serve U.S. strategic interests in North Africa and the Sahara more or less in a similar fashion that Israel (and now Turkey, Saudi Arabia) are U.S. strategic partners elsewhere in the region. Algeria’s strategy here is based on both hard politics – ie, the U.S. emerging from the Cold War as the world’s only superpower (at least militarily) and most probably watching the United States and its allies decimate Saddam Hussein’s Iraq, Algiers preferred to befriend rather than alienate Washington, and to convince Washington that it could be `useful’ to it. Of course, Algeria’s neighbor, Muhammar Khadaffi efforts to implement more or less the same strategy resulted in the collapse of his regime and his assassination. Algeria hopes to avoid a similar fate. Understanding well, that `fighting Communism’ was now a thing of the past, and partnering with Washington in “the war on terrorism” was the `only show in town’ (`the town’ being the world), Algeria moved to to prove it could be useful in a number of ways. Fro example, just after 9-11 the Algerian authorities presented their American counterparts with a list of 500 Islamic terrorists as a friendly gesture. Military exchanges followed as did visits by high level State Department and Military representatives from the USA. They continue. While the Algerians vociferously deny it, there is much evidence that until the Algerians discovered that the United States was using its facilities to spy on Algeria itself, that the U.S. special forces had established a military base in Tamanrasset, in the heart of the Algerian Sahara. Evidence has yet to be presented that Algeria, like so many other countries in the region, participated in the C.I.A. rendition efforts, but then, neither has their participation been dis-proven. Regardless, U.S. – Algerian security ties enjoyed a level of unprecedented cooperation in the decade since 9-11, relations that despite strains, particularly over Mali, continue. But despite these improved relations, the Algerians were not sure of the relationship. Access to Algerian intelligence and security matters remained limited. Algeria most often refused to participate in joint military maneuvres which would have permitted the United States to evaluate its military strengths and weaknesses. U.S. efforts to involve Algeria in the Sahel akin to American success at pressing Ethiopia and Uganda to send troops to Somalia proved fruitless. Although Algeria had proven its ability to both manipulate, divide and destroy the Islamic based opposition movement which challenged the Algerian generals for power in the 1990s, the junta still felt a need to `prove itself’ to Washington. Prove what? – that it could still be used to crush opposition movements. Which brings us back to the Seddat operation. There were a number of curious, if not downright bizarre aspects to it. For one thing, it was a massive, lopsided operation, one that pitted the Algerian military and security forces, numbering in the hundreds of thousands all tolled, against a few dozen poorly equipped Islamic guerrilla fighters in hiding in Kabylie caves with their women and children. Reminds one of the U.S. invasion of Grenada in the early 1980s. Algiers seemed to be eager to prove that when “necessary” it was willing – as it had done in the 1990s – to use the full power of its military machine against its own people.The Algerian assault team, led and personally directed by Algerian General Ahmed Gaid Salah, major general of the Algerian National Army, was several thousand strong with communications and logistical support from the entire Algerian state apparatus. It was heavily armed with tanks, armored cars, attack helicopters, perhaps chemical weapons and all those military toys that so please military dictators from Algiers to Guatemala. Seddat was an exercise in overkill of gargantuan proportions to counter what was at best a lilleputian threat. Most anti-guerrilla operations are done in secret but the Seddat operation was publicly announced several months before in the Algerian press as something approaching a sporting event and followed closely by the Algerian media from beginning to end. It was all a show of sorts, with the Algerian military asserting its overwhelming strength to the world at large, and to the United States and France in particular. It is a fact of no little significance that the U.S. military attache to the Algiers embassy at the time was `invited’ to accompany General Gaid Salah on this mission and to watch the slaughter unfold from up close. Indeed, one could make a persuasive case that the whole affair was stage managed down to the last detail to impress the Americans Washington should take note! To insure the operation’s success, the Algerian authorities set up a situation that would insure that the government’s casualties would be few, while the rebels would die in large numbers. The government’s own statistics stated that there were no more than 75-100 militants holed up in caves near Seddat at the most. Even this proved to be an exaggeration. If Seddat had been a purely military or counter-insurgency operations, certainly, the rebels could have been flushed out and neutralized with a much smaller force and much less publicity. Nor was all that communication and military hardware necessary as the group’s location was already pinpointed. Unlike in In-Amenas, where the Algerian special forces lost control of the script, (more on that in a latter segment), at Seddat, everything went as planned. The guerrilla base was wiped out. Obviously it was not a particularly difficult task. The American military was duly impressed. The show was apparently worth the effort as shortly after Seddat cooperation between the U.S. and Algerian militaries ratched up considerably. Still, news reports of the contrived confrontation, even coming from Algeria’s controlled media, were unsettling. As the details of the operation found their way here and there in the Algerian press, a more cynical picture of what had actually happened began to take shape. For example, the 75 to 100 `guerrilla fighters’ turned out to be only six. The rest were women and children killed in the assault, `collateral damage’ which the Algerian security forces didn’t hesitate to inflict. Never one to be too concerned about collateral damage, Washington was impressed. There were few local witnesses to the aftermath. At least one claimed to have seen the bodies of a woman breast-feeding her baby, both frozen in death. There is some speculation that the only way people die frozen in their last life activity like that, is if they are the victims of poison gas attack which kills instantly. The allegation, will, like the mother and children, be frozen in uncertainty because the day after burying the victims’ bodies were, according to witnesses, disinterred by the military and cremated, thus eliminating the possible evidence. But it is suggestive, isn’t it, that when deemed necessary, the Algerian military has no compunctions about gassing its own people? At least once before in the Middle East, the United States was greatly impressed by the military prowess of a regional player, by its military superiority over its neighbors. I speak of Israel’s victory over Egypt and Syria in the June, 1967 War. Thus began a strategic alliance, couched in the false language of `common values’, `defense of the only democracy in the Middle East’ and other pretexts. What impressed Washington in 1967 more than `common values’ was the power of the Israeli air force and the devastating blow Israel could inflict on Syria, Egypt and the West Bank in six short days; in so doing, secular Arab nationalism to which Washington was adamantly opposed suffered a blow from which it never entirely recovered. Thus began a well known strategic love affair that continues until today. Israel had impressed Washington that it could serve U.S. regional interests. Something like that is now happening in North Africa with Algeria, an unlikely U.S. ally given its half century of anti-U.S., anti-imperialist rhetoric. Algeria has spent the decade since 9-11 trying to impress Washington that it could play a role in North Africa for the United States similar to what Israel plays in the Eastern Mediterranean. The Seddat Massacre – and that is essentially what it was, a massacre – was orchestrated with such a future for Algerian-U.S. relations in mind. It was a part of the overall effort to attract American attention. In fact, Washington was impressed, so impressed that in 2012, the Obama Administration through AFRICOM General Carter Ham and U.S. Secretary of State Hillary Clinton spent a good deal of political energy trying to get Algeria to intervene militarily in neighboring Mali, to no avail. But however closely the Algerian Junta hopes to snuggle up to Washington, it was still not ready to be its military cat’s paw in the Sahara. At a recent talk at the University of Denver that I attended, General Ham, who impressed his audience of students that AFRICOM was more like the Peace Corps than a military special forces attack unit, noted that he had visited Algerian President Abdelaziz Bouteflika to send a military contingent to Mali. French President Hollande visited Algiers and did likewise, to no avail. On this critical issue, Algeria has balked. In the end, for reasons I will develop in the proceeding sections of this series, the Algerian government, having led on the United States, refused to pick up the military baton and send its troops into the Malian fray, one of the smarter decisions it has made in a long time. The Algerian generals might crush their own insurgencies and do so by whatever means necessary, but even this dictatorship has been careful not to involve itself, militarily at least, the affairs with its neighbors. The one time it did, by supporting the POLISARIO movement in the Western Sahara, it got a pretty bloody nose. After reading all this, one might wonder logically, what does all this have to do with the In-Ameras fiasco? The answer is everything, to be elaborated upon as the series unfolds. I also want to credit Habib Souaidia, author of La sale guerre (The Dirty War) – Editions Decouverte. 2001. It was in conversations with Souaidia that I first was made aware of the Seddat Massacre. Jeremy Keenan. How Washington Helped Foster the Islamic Uprising In Mali. John Schindler. Algeria’s Hidden Hand. Immanuel Wallerstein. Mali: The Next Afghanistan (note – Although Wallerstein predicts there would be no French intervention, and I guess misjudged that part of the situation, his discussion of the internal Malian and regional forces at work, is a la Wallerstein, very good, as his explanation of the dynamics prior to the Frenchy military incursion.